Emergency dental offices are run much like a regular dental office would, so you need to make sure you arrive at least 15 minutes before your emergency appointment is due to start. This is so you can have enough time to fill out any paperwork the emergency dentist has for you without cutting into your appointment. If you haven’t already, calling ahead and inquiring about whether or not your insurance is accepted is also important. If it’s not, asking for a quote, or a general price range, is also a good idea so there are no surprises or complications. Your emergency dentist and their team will need to know if you’re currently taking any medications and if you have any allergies, so make sure you inform them verbally or by making a written list. They need to know so they don’t use or give you anything that will react with your medication or cause an allergic reaction. Bringing any recent dental records with you to show your emergency dentist will give him or her a better idea of your patient profile and what you’ve recently had done, even if it’s just a detailed receipt for a recent cleaning, for example. Finally, if you’re feeling any bit nervous about your appointment, we hope you’ll feel better knowing that all of the emergency dentists in our network, including their staff, know how to make their patients comfortable. Whatever concern you may have, they will do whatever they can to settle your nerves and make sure you’re okay. Broken dentures are just like any other dental emergency – they need to be fixed as soon as possible. If you need same day emergency denture repair, we have the emergency dentists and the lab technicians to do it. Unfortunately, sometimes it’s not possible for a pair of dentures to be fully repaired, so new ones may be required. If this is the case, don’t worry, we can have you fitted for new ones on the spot! Because dental emergencies don’t exactly announce what they are when they happen or give you a time and day for when they plan to show up, so having an idea of what the most common dental emergencies are can help you identify when you’re having one. For starters, certain dental emergencies, such as having a tooth knocked out, will show up and make themselves known immediately. An abscessed tooth, however, is the result of underlying dental issues that were left to fester. 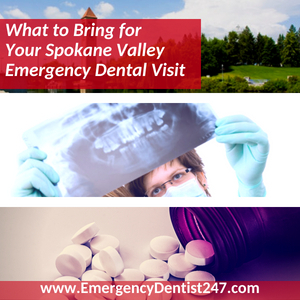 Knowing when you’re having a dental emergency is important, but you also need to know when it’s time to visit your local hospital’s emergency room instead of an emergency dentist. For example, if you’ve had some teeth knocked out in a car accident but received head trauma, as well, you need to go to the hospital first and the emergency dentist after. Losing one or more of your adult teeth can be scary, especially if it happened as a result of a traumatic accident, like a car accident, for example. Before you call us, you need to make sure that you are clear of any head trauma that requires you to be treated at your local emergency room. 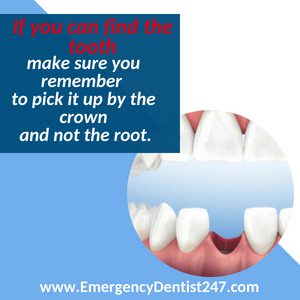 If you can find the tooth, or teeth, that you’ve lost, make sure you remember to pick it up by the crown and not the root. Any damage to the root of a tooth may make it impossible for the emergency dentist to safely plant it back in the socket. Next, rinse it off with some water to keep it clean. If the tooth and the socket haven’t taken too much damage, you can try and put the tooth back in yourself. Doing so is the best way to preserve the tooth until you can get to your appointment, but putting it in a cup of milk or water will do the trick, too. Abscessed teeth and oral infections can develop and fester a lot faster than you’d think. For example, a chip happens close to the gum line, creating an entrance for bacteria, food, you name it. Your toothbrush isn’t able to clean in there, which in turn allows an abscessed tooth to form. Unfortunately, abscessed teeth and oral infections aren’t always easily spotted, especially when the infection is inside your tooth. 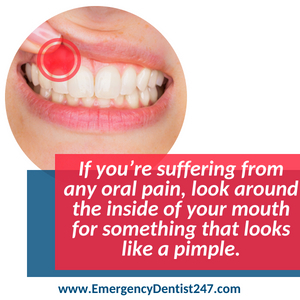 However, sometimes you can get lucky and spot what looks like a pimple inside your mouth. Abscessed teeth and oral infections are no joke. They are extremely dangerous and, if left untreated, become a life-threatening problem. 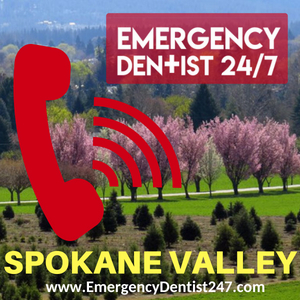 If you suspect you have an abscessed tooth or any form of an oral infection, call us at (509)-553-0972 straight away. Unfortunately, it’s pretty common for patients to lose a filling or a crown, but there are many different ways you can save your tooth while we book an appointment for you. The minute you realize you’ve lost a crown or a filling, you need to spring into action and head to your local pharmacy or general drug store to find some dental cement. If none is available, using a small piece of gauze or a cotton ball to plug the hole in your tooth will also work, too. Overall, just make sure you cover that hole. 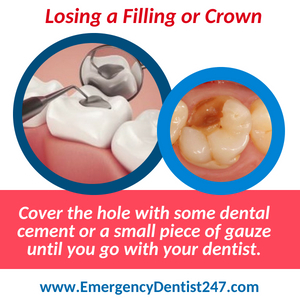 If you leave the tooth exposed to food, drinks, etc., instead of filling it back up or putting a crown back on it, the emergency may have to remove it. The last thing you want to hear from your emergency dentist is that you need to have a tooth pulled. Fortunately, the emergency dentist and their team will do everything they can to save your tooth before they make the decision to pull it, so don’t lose hope yet! The extraction process itself only lasts a couple of minutes. 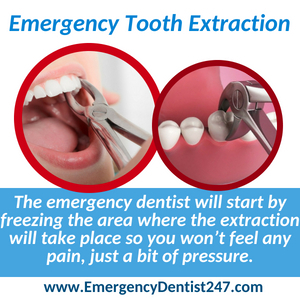 The emergency dentist will start by freezing the area where the extraction will take place so you won’t feel any pain, just a bit of pressure. Once you and the emergency dentist are in full agreement that you can’t feel a thing, they will use a pair of dental pliers, which aren’t as scary as they sound, to gently rock the tooth back and forth in its socket. If the tooth isn’t able to be removed whole, they will carefully break it up into little pieces and remove them. The amount of time it takes for the extraction site to fully heal is completely up to you. Once the tooth is extracted and everything is done, the emergency dentist will take some time to speak with you about taking proper care of the extraction site to ensure an infection doesn’t form and that the amount of time it takes to heal is as minimal as possible. It’s crucial that you know the difference between going to an emergency doctor versus going to an emergency dentist. The condition you’re in when making the decision could be time-sensitive or life-threatening, maybe even both, so it’s important that you make the decision quickly. For starters, emergency doctors are not equipped to deal with dental emergencies. They can help you with pain management and remove a tooth, but that’s about all they can do. They can, however, treat your head trauma and any other injuries you may have. Some hospitals have emergency dentists on staff or on call, but that’s very rare to find. An emergency dentist can deal with whatever oral emergency you may be experiencing right away, including pain management to an extent, but they can’t help you with head trauma or any major injuries.